I whipped this quilt up in three days. It represents two firsts for me: it's my first commissioned quilt (yay!) and the first project I really goofed and sliced my finger really well with the rotary cutter (boo!). No gross bloody pictures here I promise (why do people do that?!) My finger is fine now- it might scar but it definitely wasn't bad enough to merit stitches. I often get asked if I sell the things I sew. People are very kind to ask this, I know it's a compliment. I usually respond, "I can't compete with online prices." Seriously, search "baby quilt" on Etsy and you will find some really low priced, nice looking quilts. Add in Etsy and Paypal fees, I don't know how people even cover the cost of materials. I really liked this experience of creating something my friend really wanted- I showed her the fabrics I had on hand, some simple designs I could do in a short time, and we made an agreement based on her price range. I know we were both happy with the arrangement and it was really nice to have it out of the door a few hours after I sewed the last binding stitch. It was definitely better than creating something random, listing it, and waiting around for it to sell! If you have thoughts on selling quilts or other handmade items, I would love to hear them! 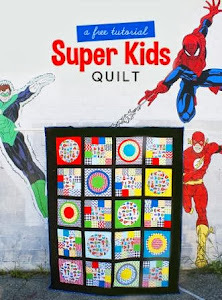 My Super Kids boy version fabrics are now running pretty low but I am happy with how I utilized them. Most of the time I am not "happy" when I run out of fabrics I love but it is satisfying when I feel that I have used them well and they're not just sitting in a pile in my stash. That's a great answer to the question that I think we all get as quilters. I completely agree, I'm not sure how some people make money off of the quilts they sell online. Unfortunately, most people are not educated on all that goes into making a quilt and don't understand the material costs of quality fabric and the time it takes. Your quilt turned out awesome, I hope the recipient likes it. 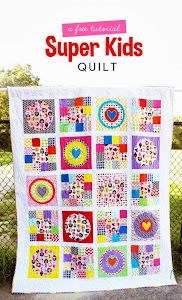 Great quilt ----have you tried superglue for sliced fingers? It works really well on clean cuts, just dry the blood off, squeeze glue into the wound and nip the edges together. It dries quickly and there is no need to wear a band-aid. No blood on fabric == result! It looks great! I love the colour combos - so bright and engaging! Ouch!!! You know I've done that... more than once;-) So cute and it's wonderful that you're both happy with the outcome! Oops! I hope you finger gets better soon. Great boy quilt love it.